I wanted to make a salad that was simple yet substantial, something we could have for dinner without feeling ravenous a few hours later. I had to use up an expensive avocado that was purchased a few days ago along with some basil and cherry tomatoes. I did a quick Food Blog search for avocado and tomatoes, and Kalyn’s blog was the first one that popped up. I have been following her blog for a while now. After checking out the recipe, I realized that I even had all the ingredients on hand, including the pinto beans! Here is the original recipe. In a large bowl whisk together the honey and balsamic vinegar and let the drained beans marinate in it for 10-15 minutes. Add the chopped onions, cucumber, tomatoes and basil to the marinating beans. Drizzle with olive oil, add salt and pepper to taste. Mix well. Gently toss the avocado cubes with the lemon juice in another bowl and then add to the rest of the ingredients in the bowl. Toss gently to combine. Serve. We had this with some garlic bread. It was a very simple and filling meal. Do head over to Kalyn’s Kitchen to check out her amazing collection of healthy and delicious meals when you can. Pinto Bean Salad goes to Raaga, The Singing Chef, who is hosting the Soups and Salads edition of the Monthly Blog Patrol. This also goes to Madhuram @ Eggless Cooking.com for her ongoing series- Your Recipe Rocks. This is also my entry for Snackshots # 4: Salad being hosted by Michelle @ Greedy Gourmet. That is such a pretty looking bowl of salad. The salad looks very good and of course healthy too. Thank you for acknowledging my series TBC. I really appreciate it. So many wonderful textures. This is my kind of salad. 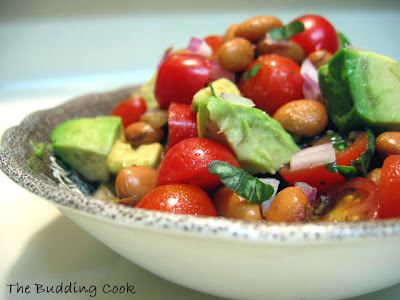 The pinto beans and avocado must've made this a very filling salad... it looks amazing! Tasty looking salad and good click. I made something similar with garbanzo beans, will have to post it. Lovely to look at TBC.. Looks refreshing and mouthwatering!! such a lovely salad! looks delicious. simple, substantial, and delicious--i'd say you found a winner! wow! !the salad looks so fresh and healthy! !love the photo.. WOW!... That was a nice colorful salad. Look so good. The picture is so appetizing. Love it..
Wow...love the colourful salad..would tempt a non-salad person too! Yeah, Kalyn has a good bunch of salads on her blog. Yours looks 'bursting with health'. That will be such a healthy dinner wish i cud have it..! You can never ever go wrong with avocado in a salad. Never! I know what you mean with salads leaving you half empty when you get up from the table. Pulses definitely do the trick. Thanks for participating in SnackShots and see you at the roundup! Looks very interesting and Pretty.I will definitely try this. Thanks for your innovative postings. This looks yummy and colourful! This looks amazingly good. So colourful, it reeks of Summer. So, is your dad cooking for you? Loks colorful & beautiful! Love the idea of raspberry shrikhand! Thanks very much for the mention of my salad. This is something I've made quite a few times now for my dad, who loves it with black beans. I love your version of this salad using basil, sounds like I must try it! I'm not a big salad fan, but this one looks very inviting T! That salad looks really tasty! I like the use of the avocado. TBC, This salad looks so refreshing . I have some avocado and just need some basil to spice up. Thanks for sharing a great recipe. looks fresh n yummy.., nice shot..